Authored by the Associated Press and published in the San Francisco Chronicle in 1969, the “Kids Shooting Peanut Butter” article claims that IV use of peanut butter and mayonnaise is a new trend. It reports that there are “several documented cases” of deaths, though no documentation is provided. The short AP article makes several errors indicating that the authors and editors had little or no expertise in the area they wrote about. It cites the information to Ernest A. Carabillo Jr. from the Federal Bureau of Narcotics. Unfortunately, it is not uncommon for members of law enforcement agencies to be as confused as the news people who repeat the errors they make. Or perhaps the unnamed reporter misunderstood Mr. Carabillo. Who knows! The story is a good example of false and essentially baseless Drug War hysteria. Sadly, this type of egregious error continues to plague drug news, for example the well-loved Face-Eating Zombie Drug meme from 2012-2018. Shulgin Geek Note: The news article was clipped, then taped to paper either by Sasha or Nina to make it more stable when filing. In the upper corner of the paper, “Newspaper – drugs” is written in long-hand pen in Sasha’s handwriting. A Federal drug expert says youngsters in some parts of the country have taken to injecting peanut butter and mayonnaise into their veins as a substitute for narcotics. In several documented cases the result has been death, Ernest A. Carabillo Jr., a lawyer-pharmacist in the Federal Bureau of Narcotics, told newsmen Monday. Other recent fads, he said, include the use of paragoric (sic) cleaning fluid, the local anesthetic ethyl chloride and freon, the pressurized propellant gas in aerosols. Carabillo said users of narcotic substances confused the bizarre and toxic reactions with the so-called “high” provided by such drugs as heroin or marijuana. He cited the smoking of dried banana skins, a fad of a couple of years ago, as an example. Frank Gulich, a narcotics bureau official stationed in Chicago, said the underground “cook books” usually sell for about $1 and often give the formulas for preparing drugs such as LSD. Background: In late 2017, Erowid Center again began sponsoring the Shulgin Archiving project. We’ve made a lot of progress in the last twelve months. Keeper Trout has been doing most of the scanning and indexing work. The materials in the archive are primarily focused on research and data collection about the chemistry, pharmacology, and use of psychoactive plants and chemicals. But Sasha had a penchant for collecting absurd, silly, disturbing, and bizarre published materials, including Drug War nonsense, weird drug-related advertisements, and other oddities. One such item that was recently uncovered is an editorial from the October 21, 1967 issue of the highly-respected peer-reviewed “scientific” journal, Nature. The editorial is titled “Hallucinations to Order”. The unnamed author, which implicitly makes this authored by the editorial staff of the journal, is responding to an article published a few months earlier, “Some New Behaviour-disrupting Amphetamines and their Significance” by Smythies et al, which explores the topic of substituted amphetamines and their relative hallucinogenic potential. One of the most alarming features of the drug LSD is that it can be made in the laboratory. In other words, there is no natural physical limitation of the scale on which, in suitably bizarre circumstances, it could be supplied to the public. It follows that those who are concerned to see that the use of drugs is controlled by legislation are at least a little nonplussed by the appearance of synthetic processes for manufacturing drugs which were originally derived from natural sources and, more especially, by the application of synthetic processes to the design of new drugs. Although it will be a long time before the flower children and their like would be able to synthesize their own psychomimetic agents, it is entirely proper that there should now be considerable anxiety about problems of control. This bizarre little hysterical opinion piece includes the strange gem: “Although it will be a long time before the flower children and their like would be able to synthesize their own psychomimetic agents […]”. As of the date of publication of this issue of Nature (October 1967), the so-called “flower children” were not only “synthesizing their own psychotomimetic agents”, but were doing so at a scale and efficiency that could be described as “awe-inspiring”. By October 1967, Nick Sand, Tim Scully, Owsley Stanley, and others had already set up, broken down, and moved their high-volume LSD production labs several times. This is documented not only in biographies and books, but also in contemporaneous testimony from law enforcement agents in criminal investigations and prosecutions. The complex issues related to the potency of LSD and its control were not only widely discussed, but were part of the reasoning for criminalizing these “dangerous drugs” in 1967. It is worth pointing out that the journal Nature was at the time (and for many years after) a key part of the machinery generating anti-drug hysteria and “scientific” public fears, such as the completely false claim that LSD caused chromosome damage. As the Shulgin Archiving project continues to progress, we will be providing access to an indexed collection, but will also point out individual curiosities with commentary. We hope that reminding people of the absurd history of the Drug War and the persistent presence of confused stories supporting it and presented as “scientific” or “news” might help society limit its repetition of the worst type of errors. We’re excited to announce that as of Saturday, September 9, the Erowid crew has reached a new high for the number of experience reports published in a single calendar year. 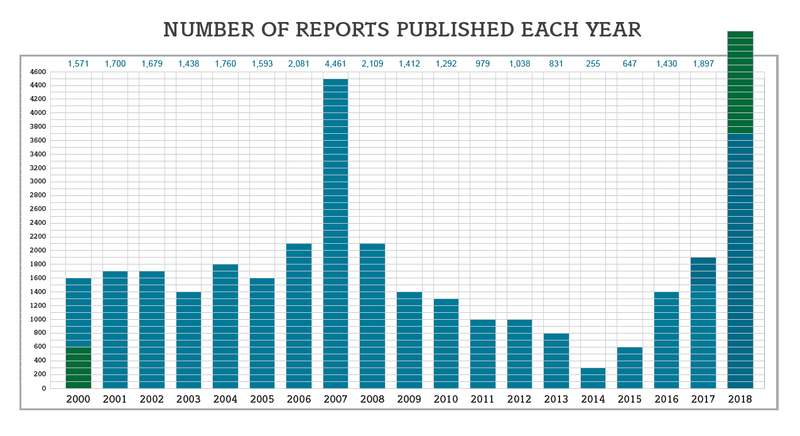 We’ve not seen such an active year of reviewing since 2007, when by year’s end, 4,461 reports had been published. As of September 26, with three months left in 2018, we’ve published 4,671 reports, exceeding the decade-old record. Late last year in November, as we began working on issue #30 of Erowid Extracts, focused on the Experience Vaults, we realized that it might be possible to beat 2007’s record number if we set the goal early. Crew members Spoon and SellieG together took on this herculean task and immediately started ramping up their reviewing of triaged submissions, publishing hundreds of reports in the final two months of 2017. But to beat 2007, they and other reviewers would need to shoot for publishing 400 reports per month in 2018. And they did it, publishing 519 reports each month for the first nine months of 2018! Erowid Extracts #30 goes into retrospective detail about the type of information that is found in experience reports, the perspectives of volunteers (in their own words), and reflections on how the collection has developed since its inception. Erowid relies on the help of dedicated volunteers to read, filter, flag, grade, categorize, and edit submitted reports. It takes around ten hours to go through the training program and then a few hours a week to be a part of the team. If you’re interested in joining the Erowid Crew, please apply at https://erowid.org/volunteer. We’d love your help!